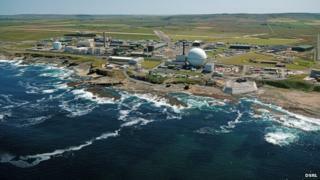 A fire in part of Dounreay's Prototype Fast Reactor (PFR) facility last month led to an "unauthorised release" of radioactivity into the environment. Dounreay Site Restoration Limited (DSRL) said "procedural non-compliances and behavioural practices" by staff led to the incident on 7 October. The Caithness site's fire brigade extinguished the blaze in the PFR's sodium tank farm within 30 minutes. Managing director Mark Rouse said DSRL has been served with an improvement notice by the nuclear industry's regulators. He said: "Our investigation identified unacceptable behaviours and practices that fell well short of our values and standards. "It is important to take the time to ensure as many lessons are learned from this incident as possible. "We are determined to improve our behaviours and compliance to ensure that we always meet the high standards expected on a nuclear site." It is produced naturally in the Earth's upper atmosphere, but is also produced by nuclear weapons explosions and commercially in civilian reactors. Levels of the gas increased in 2012 compared to 2011 due to work to decommission Dounreay's fast reactor and prototype fast reactor. The fire occurred in a building where tanks are used to store sodium. The incident happened on the same day a blaze broke out on a ship transporting radioactive waste from Dounreay to Belgium. The blaze started in one of the MV Parida's two funnels on the night of 7 October. It lost power and started drifting towards an oil platform in the Moray Firth. Fifty-two people on the rig were evacuated as a precaution. Following repairs the ship was able to resume its journey. Director Lang Banks said: "Thankfully no-one was injured in this incident. However, that the fire resulted in the release of radioactive material is deeply worrying and calls into question the processes currently in place to protect people and the environment. "There needs to be a thorough review of procedures to ensure noting like this can ever happen again. "This incident again highlights the hazardous and expensive problem of dealing with the radioactive legacy of the nuclear industry." Environment Secretary Richard Lochhead said the Scottish government viewed the matter as "extremely concerning" and expected industry regulators to closely monitor work at Dounreay. He said: "It has been identified that procedural non-compliances and behavioural practices were factors in the fire incident last month. "This is simply unacceptable and must end immediately." Mr Lochhead added: "Scottish government officials will be meeting with Dounreay senior management shortly to discuss the issue and find out what measures they are putting in place to address regulators' concerns."